Finished in all standard Premier colors. 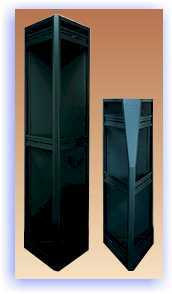 Typical Trimline Series enclosures shown with plexiglass and painted metal doors. Wedge frames are designed to enable the construction of console stations in variable bayed configurations using standard modular units. Single piece or multiple piece work table units are available for any configuration specified to form a unitized console. With the utilization of casters, consoles may be made into moveable stations. 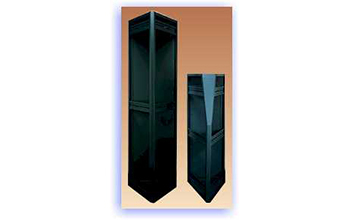 Wedge frames are welded steel with one-piece bottoms and tops. Full size removable rear panels are included. Ganging kits (CGK-6) are available for adjacent bays. 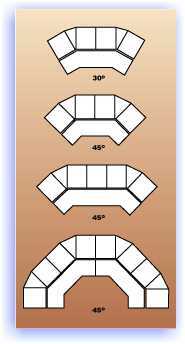 Curved consoles using wedge frames can be made in “U” shapes or “L” shapes to accommodate available space and human engineering requirements. Writing surfaces may or may not be needed for specific applications. We suggest that rough sketches (as illustrated on the left), outlining your general specifications, be submitted to our Engineering Department for exact dimensioning, estimating and possible suggestions to meet your specific needs in the most economical manner.